Step one- admit there is a problem. I shared about my sin of discontentment here. Step two- find out what is causing the problem... read the three main causes of my discontentment here. And today's post is step three- now what? Now that I know what is causing me to be discontent, how can I battle it and ultimately put it to death? 1- Jesus... I mean seriously, He is always the answer, but in an actual here-is-a-step-you-can-take-way I say number one is prayer. Lots and lots of prayer. It starts with a prayer of confession, admitting that you are struggling with ______ *fill in the blank with your sin* mine is being content. Confession is about complete and absolute surrender. Not just, "God, here's a peek at this sin I'm harboring in my soul, now I'm going to close myself back up and keep it"...nope. Our prayer of confession (for any sin) should have a portion in it of, "here it is Lord, now I give it to you." And sometimes for the really deep-rooted ones you may even have to pray for God to give you the strength to give it to him or for God to take it. Just like in a garden, when weeds have started to grow, you can't fully combat them unless you get all the way down deep to the roots. It does no good if you see the weed and try to just cover it up by kicking a little dirt over it or ignoring it. And God is not fooled. He still sees it, despite our best efforts to cover it with half-hearted attempts to "do better" in our own power. The only way to fully begin putting that sin to death in your life/heart/mind/being is to come completely clean and rest in the power of God through the Holy Spirit. This means daily prayers calling on that power to be aware and to resist. 2- The Word. Seriously, read your Bible. I know, these steps should already be part of our daily walk...should being the key word in that sentence. 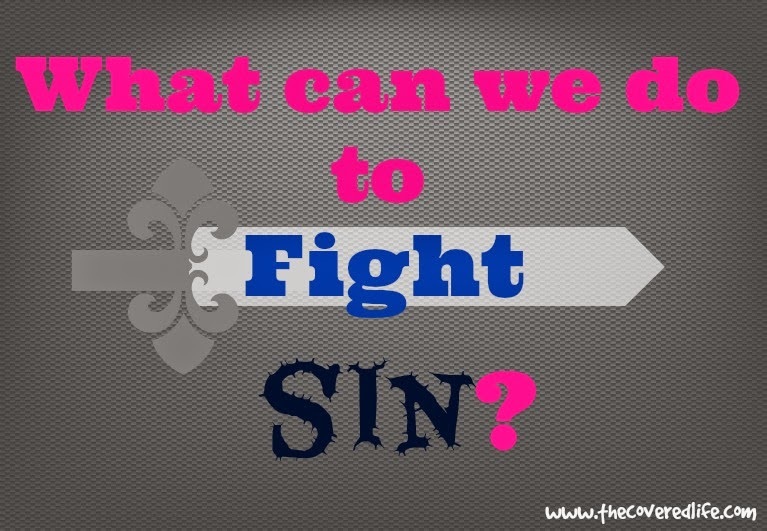 But if we've allowed sin to creep into our lives- hearts/minds/souls- then chances are we missed a step somewhere and we need to get back to basics. As a place to start, find scriptures that deal specifically with the sin you are struggling with, in my case contentment. Write down these scriptures so you can keep them handy. Study them. Meditate on them. Read scriptures that remind you of who God is and help keep your focus on Him. Read scriptures about Jesus, learning more about him (how can we hope to look more like Jesus, if we don't know him) and about his sacrifice on the cross- it's less tempting for me to sin, when I am reminded of the payment Jesus paid for my sin. 3-Take notice of your triggers and avoid them. This is accomplished through prayer and God's word as well. In my case, I pray for God to reveal to me when I am becoming prideful or playing the comparison game- basically when I am losing my focus on him. When I am open to the Holy Spirit revealing to me when I am encountering a trigger, I can just as quickly pray for strength to avoid it. For me, most of the time it's a single thought. An untruth that Satan wants to plant in my heart so that it will root and grow and affect my actions and reactions. But when I immediately see that untruth for what it is- a lie from the devil, I can stop dwelling on it and instead fill my mind with God's truths from his word. Seriously, God's word is our only offensive weapon, how much better will we be equipped to fight if we have his word stored up in our hearts. Then we can call on it in those times of battle! 4- Get a trusted brother/sister in Christ to be an accountability partner for you. This IS NOT your best friend, usually. The reason is, that our best friend will typically side with us no matter what, making them an enabler in most cases. However, this isn't always the case. My husband is my best friend. And though he loves me dearly and is my biggest supporter, he is also my accountability partner. He speaks to me in truth, calling me out when I slip up and pointing me to Jesus. As the spiritual leader of our family, I am so extremely grateful that this is the case... but as a human, who struggles with sin, it's not fun or enjoyable. But I believe if you are a Christian, who is truly desirous of loving Jesus and looking more like him, that though it may ruffle feathers (mainly pride) you will graciously receive their words for what they are- truth spoken in love- even if it hurts. The key for this step, is to find a Christian brother/sister who is mature in their faith. Someone who will tell you the truth based on scripture in a loving and gracious way. Someone who cares about you and your faith. So these are the basic steps I am using to fight sin, in my case the big one at this time is being content. But I believe these steps can be applied to most any of my sin struggles- overeating, bitterness, not forgiving, gossiping... Will this cure me from ever feeling discontent again? Doubtful. But whenever I get to that place, I'll start back at the basics and make sure my heart, mind, soul, and strength is loving God fully.